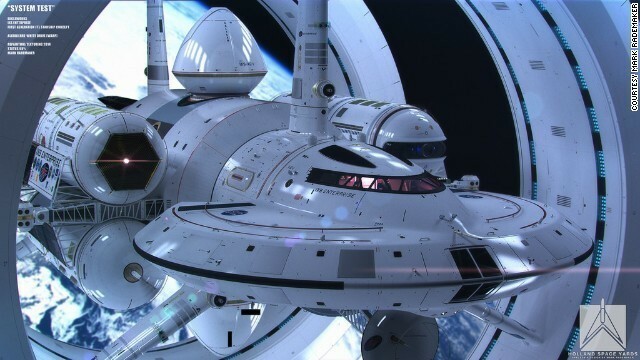 Images like the one here are buzzing around the internet, along with breathless articles talking about NASA’s design for a warp drive starship. Just so we’re clear, NASA is not working on a warp drive ship. What they have done is thrown some spare change toward researching what is sometimes referred to as an Alcubierre drive, named after Miguel Alcubierre, who published an article in Classical and Quantum Gravity on a kind of warp drive. As I mentioned in an earlier post, the paper was a way of testing the theoretical edge of general relativity. One of the big downsides of the Alcubierre drive is that it would require large quantities of something with negative mass, for which there are no real known candidates. I have no problem with tossing a little money at wild ideas. It is the scientific equivalent of buying a lottery ticket. The odds are long, but the payoff would be huge. But at the risk of sounding like a curmudgeon, this kind of hyped, glossy display grinds my gears, particularly when its supposed goal is to inspire the next generation of STEM students. We don’t need hype to inspire STEM students. The reality of modern science is cool enough without the hype. Just look at what we are doing right now. We have a probe on its way to Pluto. We have another one that will land on Ceres. We have rovers on Mars. We have a global array of radio telescopes. We have a space station. We have satellites discovering planets around distant stars. That’s just in the field of astrophysics. We’re developing materials on a molecular level, manufacturing organs, creating self-driving cars, building robotic limbs that restore real functionality to amputees. That’s not the future. It’s happening right now as you’re reading this. If you’re a young person interested in STEM, and you work hard toward your dream, these are not the things you’ll be working on. They are the things you will study in college. The things you’ll work on will be much cooler. Imagine working on a project to mine asteroids, or mapping a billon stars in our galaxy, or using the next generation of space telescopes to study the atmospheres of possibly habitable exoplanets. Imagine going to the Moon, or even Mars. Those are dreams you can make real. Science is a noble profession. It is worth pursuing if it is what drives you, and it can be deeply rewarding. But don’t buy into the hype. I totally agree with Brian in not buying into the hype. Students ought to find objectively factual verifiable evidence awesome enough!!! Very well said, sir. This whole thing has been grinding my gears as well (particularly the HuffPo-like headlines: “You won’t believe what NASA is working on now!”… ridiculous). Sadly, I’ve seen a lot more of that, and a lot less reasonable dialogue like yours. So, keep ’em coming… you are a true searchlight casting through faults in the clouds of delusion! Irascible sigh of agreement from another curmudgeon who has a liking for plain, unvarnished, facts.